↑ Ninth-century West Saxon kings before Alfred the Great are generally described by historians as kings of Wessex or of the West Saxons. 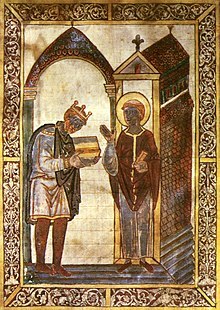 In the 880s Æthelred, Lord of the Mercians, accepted West Saxon lordship, and Alfred then adopted a new title, king of the Anglo-Saxons, representing his conception of a new polity of all the English people who were not under Viking rule. This endured until 927, when Æthelstan conquered Viking York, and adopted the title rex anglorum (king of the English), in recognition of his rule over the whole of England. The term "Englalonde" (England) came into use in the late tenth or early eleventh century.